A collection of only quality free & premium WordPress themes. You can choose from the following 2 ways to install the theme. In the dashboard, go to Appearance -> Themes and click the “Add New” button. Click the “Upload Theme” button. Choose “graphy.zip/graphy-pro.zip” file and click “Install Now” button. Extract the “graphy.zip/graphy-pro.zip” file, then prepare the “graphy/graphy-pro” folder. In the dashboard, go to Appearance -> Themes and click the “Activate” button. After you install the theme, a notification will be displayed regarding installing recommended plugins. Jetpack is a plugin that adds various additional features to WordPress. Please install it if you want to use the “Related Posts (You might also like)” feature located beneath individual posts. Graphy also supports Infinite Scroll. WP Instagram Widget is a plugin that adds a widget to display Instagram posts. Please install it if you want to use the “Instagram Widget” feature at the bottom of the pages. To install the recommended plugins, click “Begin installing plugins”. Click the checkboxes on the plugins to install, select “Install”, then click “Apply” button. Wait until the plugin install process is complete. Once the install process is complete, click “Return to Required Plugins Installer”. Click the checkboxes on the plugins to activate, select “Activate”, and then click “Apply” button. This completes the plugins installation. From the dashboard’s Jetpack page, click “Connect Jetpack”. When you are taken to the Jetpack page, click “Approve”. Return to the Jetpack page of the dashboard and click “Jump Start”. You can also click “skip” and activate features manually. This completes the Jetpack plugin setup. The Graphy theme offers the following customization options. From Customize > Site Identity you can set the site title and tagline. You can also hide the tagline. From Customize > Fonts you can set the header and body text to a variety of fonts. From Customize > Colors you can set link colors. From Customize > Title you can set the title font. From Customize > Logo you can set the logo. From Appearance > Menus or Customize > Menus you can configure the menus. No text is displayed, only icons. If this is unset, the icons will not appear. The page list appears by default if you do not set this. From Customize > Header Image you can set the header image. The header image is displayed on the blog posts index page. If you use static front page, please set the featured image instead of the header image. From Customize > Featured Posts you can set the posts that will be featured on the homepage slider as well as in the Graphy Featured Posts widget. From Customize > Post Display you can set how posts are displayed on the blog posts index page. You can also hide elements such as categories, date, author name, comments number, featured image, author profile, and post navigation. From Customize > Category Colors you can set the colors for various categories. From Appearance > Widgets or Customize > Widgets you can configure widgets. Displays while following the PC’s scrolling. From Appearance > Widgets or Customize > Widgets you can configure the Instagram widget. After you install the WP Instagram Widget, the Instagram widget is added. You can add to the Instagram Widget area, which you should configure in the manner shown in the image below. If unset, it will not appear. From Customize > Footer you can set the footer text and hide the theme credits from here. From Customize > Custom CSS you can set custom CSS or Google Fonts. The Graphy Theme comes with the following 3 custom widgets. Graphy Profile: Displays a profile with a photo and social media links. Graphy Recent Posts: Displays recent posts with featured images. 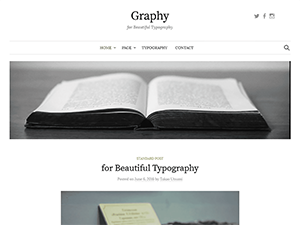 Graphy Featured Posts Pro: Displays the posts set in the Featured Category. In the dashboard, go to Appearance -> Menus and click “create a new menu”. Enter the name of the menu and click the “Create Menu” button. Select the pages you wish to add to the menu and then click the “Add to Menu” button. You can add links and categories. You can also change the item order by dragging. Once you have determined the menu’s item/item order, Choose where you want the menu to be displayed from Theme locations and click the “Save Menu” button. With this the menu creation is complete. Click “create a new menu” again if you want to make another menu. You can select post format from Format on an individual post screen. Supported formats are: Standard/Aside/Audio/Chat/Gallery/Image/Link/Quote/Status/Video. You can also set a featured image from the Featured Image box. After you install Jetpack, go to Jetpack→Settings and activate Related Posts. Under Settings→Reading the Related posts section will be added, and from here you can configure how you want it to display. You can set a page template by choosing the Template attribute in the Page Attributes box on an individual page. Page templates available are Default Template, No Sidebar, Full Width. After you install Jetpack, go to Jetpack→Settings and activate Contact Form. Click “Add Contact Form” button on the page editor. Configure the form, then click “Add this form to my post” button. Confirm that the code has been appended. When you look at the preview or publish the page, the form will be displayed. You can choose from the following 3 ways to update the theme. When an update for the theme is available, you will be notified and can download it from the Dashboard -> Updates or Appearance. In Dashboard -> Updates select the Graphy theme and click the “Update Themes” button. In order to update from the dashboard, you will need to delete the old theme once and reinstall the theme. Theme settings are inherited. Prepare the new “graphy.zip/graphy-pro.zip” file. In the dashboard, go to Appearance -> Themes and activate another theme. Once the old theme is deleted click the “Add New” button. In order to update via FTP, you will need to delete the old theme once and reinstall the theme. Theme settings are inherited. Extract the new “graphy.zip/graphy-pro.zip” file, then prepare the “graphy/graphy-pro” folder. 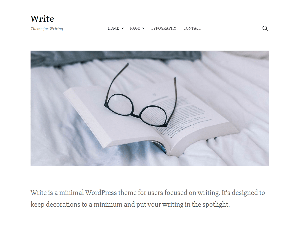 Delete “…/wp-content/themes/graphy/” or “…/wp-content/themes/graphy-pro/” folder via FTP, and transfer the “graphy/graphy-pro” folder to the “…/wp-content/themes/” directory.